As part of a grant from the National Science Foundation, FIU and two other Florida universities will receive $1 million each in student scholarships to remove financial barriers to student success and increase the number of graduates in computer and information technology. The scholarships are part of a $5 million, five-year grant awarded to FIU and its partners, the University of South Florida and the University of Central Florida, in support of the collaborative Florida IT Pathways to Success project. The goals of the project, which build on a previously awarded TEAm Grant from the Florida Board of Governors, include recruiting, retaining and providing scholarships and other support to academically talented students in IT-related disciplines who have financial need. Located in Florida’s three largest metropolitan areas, the three institutions comprise the Florida Consortium of Metropolitan Research Universities. Collectively, these universities serve about half of the students and produce about 65 percent of the IT graduates in the State University System. Historically, science, technology, engineering and mathematics – or STEM – degrees take longer to finish than other majors. In some cases, students run out of financial aid before they are able to graduate. With this in mind, some of the scholarships are aimed at preventing students who are close to completing their degrees from being derailed by financial pressures. “This grant will support our commitment to those students at risk of dropping out of college when they are within striking distance of graduation,” said Mark Weiss, the principal investigator of the grant. He is also the associate director for academic affairs at the School of Computing and Information Sciences within the FIU College of Engineering and Computing. Funds from the grant will support each institution’s ongoing efforts to align degrees with the state’s workforce needs. “This grant will allow us to empower students to pursue computer science degrees and help prepare them for careers in these high-demand areas,” said co-principal investigator Zahra Hazari of the STEM Transformation Institute and Department of Teaching and Learning in the FIU College of Arts, Sciences & Education. Computer science has been positioned as an emerging critical discipline for American students. Last year, there were more than 600,000 high-paying tech jobs in the United States and not enough people to fill them. By 2018, it’s projected that 51 percent of all STEM jobs will be in computer science-related fields. STEM is an important part of FIU’s contribution to workforce preparation, innovation and research for Florida and the nation. 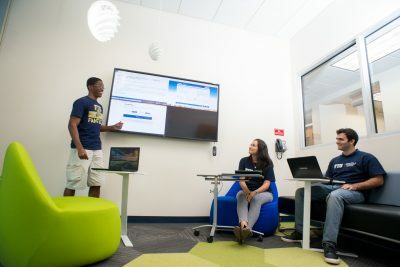 The College of Engineering and Computing accounted for 56 percent of FIU’s STEM degrees in the last academic year, with more than 400 of those graduating with a degree in computer science or information technology.